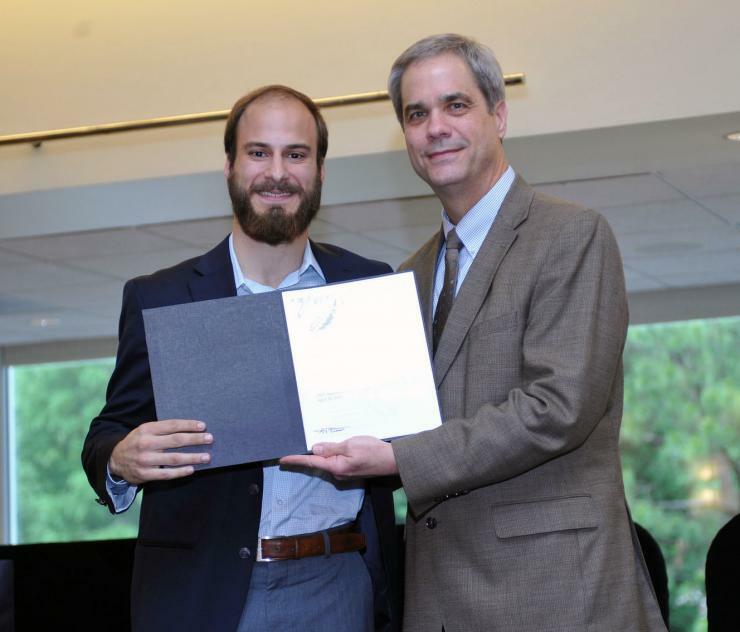 George Tzintzarov receives the Love Family Foundation Scholarship award from Rafael Bras, provost and executive vice president for Academic Affairs at the Georgia Institute of Technology. 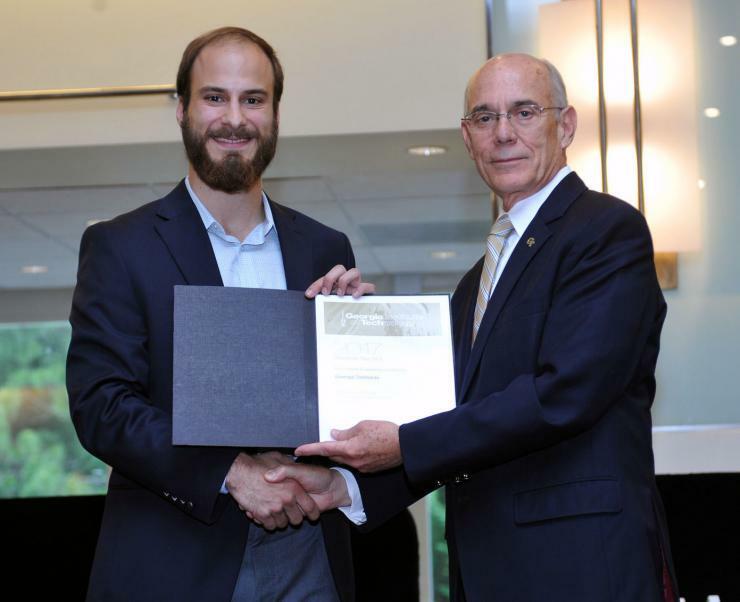 Electrical engineering student George Tzintzarov was awarded this year’s Love Family Foundation Scholarship for his outstanding scholastic record at the Georgia Tech Student Honors Celebration on April 20, 2017. The scholarship represents the highest achievement for a graduating senior at Georgia Tech. Students of all six colleges are considered equally. The award, together with a check for $10,000, is given by the Gay and Erskine Love Foundation. This year, Tzintzarov shares the honor with co-recipient Charles Wang, a dual major in chemistry and computer science. In addition to receiving the prestigious Love Scholarship, Tzintzarov was also awarded the Outstanding Electrical Engineering Senior Award by the School of Electrical and Computer Engineering. Tzintzarov has maintained a 4.0 GPA while engaging in multiple academic enrichment activities outside of normal coursework. He held summer internships at Cisco and Boeing, and he has worked as a co-op student in the Georgia Tech Research Institute’s Electronic Systems Lab. Tzintzarov was able to get a taste of research in two different labs during his undergraduate career. He worked in Professor Ayanna Howard’s Human-Automation Systems (HumAnS) Lab through the Opportunity Research Scholars (ORS) program and was later an undergraduate research assistant in Professor John Cressler’s Silicon-Germanium Devices and Circuits Lab. Propelled by his exposure to undergraduate research, Tzintzarov is now pursuing a Ph.D. degree with a focus on microelectronics/microsystems with Professor Cressler as his advisor. Outside of the lab, Tzintzarov is a member of Sigma Phi Epsilon fraternity and led efforts to improve his fraternity’s academic performance while maintaining a healthy and balanced lifestyle. He hopes to inspire his brothers to be great leaders both at Georgia Tech and in life. Given his numerous accomplishments, perhaps the most impressive part of Tzintzarov’s journey is where it began—in a small town in Eastern Europe. Below he expounds on his “American Genesis” story and how his upbringing made him the man he is today. You moved to the United States when you were eight years old. Tell us a little about that transition, your family, and how the two impacted your journey to Georgia Tech. I was born in Bulgaria in 1992. My parents won a green card around 1999 which allowed us (dad, mom, and me) to move permanently to America in April 2000. When we arrived in America, none of us spoke English. So you can imagine it was a difficult transition coming from a small town in Eastern Europe to the very, very, large city of Atlanta. Reflecting on my 17-year journey in America is actually quite humbling. When we first moved, my parents started to work at a local ice-cream shop while I was going to elementary school as a 2nd grader. I remember just being lost in a world where no one could understand my needs/thoughts/comments and I couldn’t understand theirs. Now I don’t know exactly how this happened, maybe it was Sesame Street mixed with Fresh Prince of Bel Air, but I had somehow learned English within a year. My 3rd grade year I was removed from ESOL (English to Speakers of Other Languages) to the gifted program. Within the following year, I got second place overall in my school spelling bee. Can you elaborate a bit more on the work you do with your fraternity as a mentor, tutor, and leader? Basically Greek life has its roots in a cause to build better, more diverse, culturally educated citizens. Especially at Tech, a fraternity is a collection of bright men who have the potential to do SO MUCH good. However, the vast cultural undertone of being in a social fraternity can go directly against building better men. In some cases, it seems to go in a direction of unfulfilling hedonism. So we are talking about a societal culture shift that NEEDS to happen. My efforts, and everything I do now as it relates to being a mentor in my fraternity, is doing exactly that: little by little changing the culture and tapping in to the potential of a fraternity being a beneficial place where boys grow up to become men. Often times the college, even with its successful attempts in promoting healthy work/life balance, feels like it emotionally deserts its own students. So to play a role in countering this feeling I am simply continuing to build my relationships with younger guys. I mentor some of the key leaders in the fraternity, and when I find time, make new relationships with younger guys. My goal is to be available with some intention, and maybe, just maybe, one day, fraternities (and sororities) nationwide will be organizations that are not “drinking clubs” and “having the best four years of your life that you will never remember,” but actual diverse, intellectually challenging organizations that promote good citizenship. What do you want to do when you finish your Ph.D.? I want to be a professor after I graduate! That is really where I feel like my passions and talents meet. I love being around younger college students because I was in their shoes a couple of years ago. I know the hardships of going through a place like Tech and I can offer at least some encouragement being on the other side. Being a professor is just that (mentorship) plus everything else that I’m passionate about: pursuing truth (research), leading a team (advisor), and consulting and revealing truth (teaching). Why did you decide to continue your graduate studies with Dr. Cressler? I think that Dr. Cressler and I share some similar passions about teaching and mentoring. The main difference is that he is REALLY good at those and I have a TON to learn. So it made sense to be a student of his, not only with the technical research, but to be on his team, to be mentored by him, and to learn from him the art of being a phenomenal professor. How has your time at Tech helped you become a better engineer and a better citizen of the world? I am humbled every time that I reflect on the fact that I am standing on the shoulders of giants at Georgia Tech. It goes beyond just learning what a Fourier Transform is; my professors at Tech have gone to great lengths to reveal to me the beauties that make up the Fourier Transform. I feel like I am indebted to so many great professors and mentors that have taught me how to think beautifully and creatively about the sciences and apply them in a meaningful way to benefit humanity. I hope that as I learn more and more about what that looks like, I’ll have the opportunities (hopefully by becoming a professor myself) to give back to society and students in the same way that knowledge was entrusted to me. George Tzintzarov receives the Outstanding Electrical Engineering Senior Award from Doug Williams, associate dean for administration and finance in the College of Engineering.